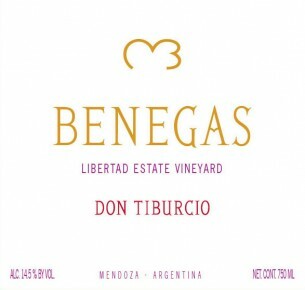 The wine takes its name from Tiburcio Benegas, the owner’s grandfather and founder of the historic ‘El Trapiche’ winery. Don Tiburcio is an interesting blend that combines Argentina’s emblematic grape variety with the complexity given by the typical Bordeaux grapes. It displays an intense and deep cherry color, clear and bright. Rich aromatic intensity, freshness and roundness in the mouth, which invites to keep drinking. The oak ageing imparts a bouquet of ripe tannins and great persistence. Enjoy it with a meal of red meat, grilled or stewed, or paste with a rich meat sauce.